Dr. Ganguly was born and raised in India. She moved to Chicago, IL in 2000 to advance her education in the field of dentistry. She then completed her residency at OSF St. Francis Hospital in Peoria, IL. Advanced dental care in a comfortable atmosphere are her priorities and she is a firm believer of preventative and conservative dentistry. 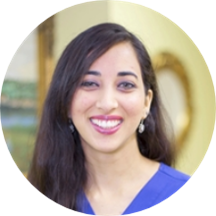 Dr. Ganguly met her husband during her residency and moved to his hometown of Houston where she instantly fell in love with the city. She feels the people, food, culture and especially the weather is what makes Houston spectacular. When she’s not practicing dentistry, she spends her time swimming and doing yoga. Her weekends are filled with catching up with friends and family over delicious cuisines.